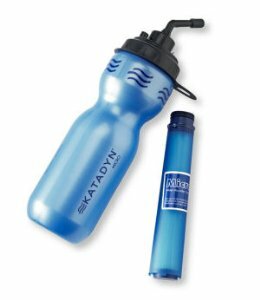 The Katadyn Micro Microfilter water bottle has been discontinued and replaced by the new Katadyn MyBottle Water Purifier . The Katadyn Micro Microfilter Water Bottle is an ideal and economical investment for the outdoor enthusiast. Whether you are hiking, camping, biking, paddling, fishing, or just want to be prepared in case of emegencies you can always drink safe water with the Micro Water Bottle Microfilter. This easy to use water bottle allows you to drink water directly from a lake or stream. The Micro meets EPA standards for removing 99.9% of cysts like Giardi and Cryptosporidium, and 99.9999% of water-born bacteria. The Katadyn Micro Water Bottle Microfilter uses a 0.3 micron pleated glass fiber microfilter and granular activated carbon to filter out impurties and leave you with great tasting, safe drinking water. Contents include 26 oz bottle (blue), 1 pleated microfilter cartridge, 1 carbon filter, and 1 carry loop for easy attachment to packs, boats, etc. « Pool Check Test Strips Store Now Open!